Growing up, I used to cringe when I walked into chain businesses and heard, “Welcome to our business!” and I would triple cringe when I walked out ninja-style and a teenager yelled from the cashier’s desk “Thank you for coming, have a great day!” I got annoyed by the jolliness in their voices and how they always saw me on the way out. It was total madness! During my college years, I worked in retail. In this line of service, my training revealed the mystery that haunted me for years, employees don’t greet because they are strange jolly creatures. They greet because it is part of their Quality Control Metrics & Procedures manual (QCM&P). Greeting, makes customers feel noticed, appreciated and most importantly, it is the most effective loss prevention tactic available. When thieves know there is a “GREETER,” (Yes, there is a position in most chain stores that is in charge of greeting people) they won’t steal. Greeters help to reduce merchandise shrinkage. Figuring this mystery out and learning more quality control procedures amazed me. There is a whole science behind the size of your burger, the registration at the gym or spa and the separation between tables in a restaurant so that customers don’t bump into the neighbors behind them. These are Quality Control Metrics & Procedures and they rarely noticed when properly implemented. QCM&P’s are only missed when customers visit the competition and notice the lack of quality provided in comparison to their vendor of preference. In business terms, it is called the ONE BEST WAY. Business owners work on the ONE BEST WAY to make their customers happy every single time with the least amount of energy at the most effective cost. Once the ONE BEST WAY is found, a procedure is created and every employee in the business is trained to make sure it is always implemented. This technique makes customers miss the sales person at the shoe store, the cashier at the bank, the warm cup of tea at the spa and the fluffy slippers at the marvelous hotel from the last leisure trip. 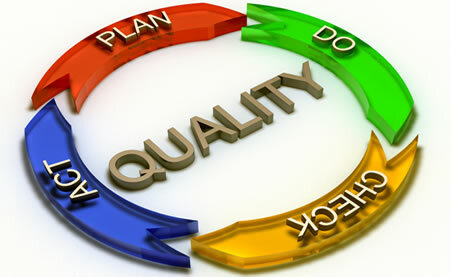 QCM&P are what make customers come back. Big corporations implement QCM&P on almost every aspect of their business, should a Small Business Owner implement QCM&P’s? WELL, YEAH! A business is never too small or too large to provide quality service to its customers. There are too many options in our market and quality controls create an edge that most small business owners don’t even think about. Quality Controls and Procedures are my passion. After I received my bachelor’s degree in Business Administration, I completed a certification in Vancouver, Canada as an internal auditor for the ISO. The International Organization for Standardization (ISO) is a worldwide organization that charges thousands of dollars to businesses to assist them to develop and implement their own QCM&P and to audit them periodically to make sure that they stay on track. Do you have to pay thousands of dollars to get certified through the ISO? As a small business owner, paying thousands of dollars to get certified through ISO, may be unreasonable but there are many alternatives. Small companies like mine, can provide with the guidelines and consulting services to generate QCM&P’s at an affordable and effective budget, or you can look online for generic tactics to create a QCM&P manual. There is a lot of information online to assist business owners to create a healthy one. Once a procedure is created, does the business have to keep it for life? No, when a procedure is added to a QCM&P manual. A revision must be made after a period of time to make sure it is still the ONE BEST WAY. If the procedure no longer makes sense to the business, it can be updated or removed and the business continues improving. When a business is trying to expand with a second location, a QCM&P manual to train new employees will help to duplicate service and ensure customer satisfaction at the second or third locations. When franchising a business, a QCM&P manual is added to the contract agreement and the business owner can have the confidence that quality will not be neglected by the new entrepreneurs. Having a business is very time consuming. Sometimes an owner cannot leave the business because employees don’t know what to do. The business owner can’t take a vacation, or showcase the business in fairs or conferences because customers suffer. Having a QCM&P manual helps to guide employees when the owner is not available. It also helps to identify and value good employees. Trained employees that don’t provide quality service are a large obstacle for growth, with a QCM&P manual, a business owner can make an educated decision to let go a bad employee, or to give bonuses to employees that goes above and beyond to provide quality service. In the event that the primary business owner has to suddenly retire from business due to disablement or death. With a QCM&P manual in place, family members can continue the business with the same vision and line of service that the founder had. A QCM&P manual can be the key to perpetuate a business for many generations. Because of these and many other benefits, don’t waste any more time and start working on it. It is a great investment and you will see immediate and long term benefits from it at every stage of your business.